Unfortunately I was unable to track down the original source of this image. While it appears to be a promotional shot for VW, please let us know in the comments if you have any more info about this photograph! *Update: Thanks to a very helpful comment from lcu20 (see below) we now know the photo was taken by Hans Hansen for a book entitled, Das Buch. Von Volkswagen. 1938-198. The book celebrates their 50 year anniversary and was an exclusive gift to all Volkswagen employees and not sold in bookstores. 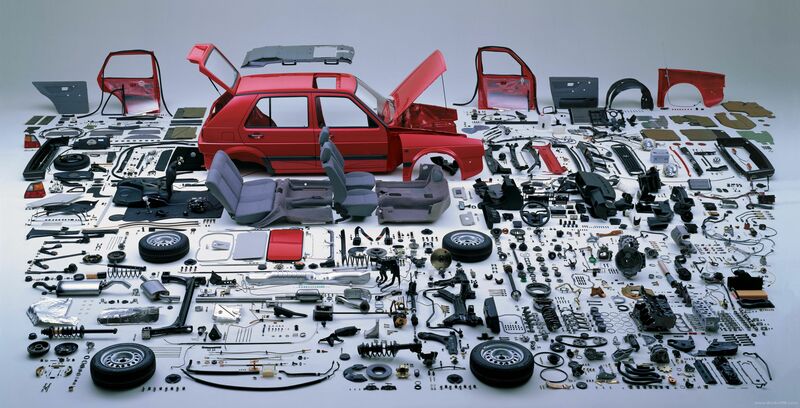 The caption tells that the photo shows a disassembled 1988 VW Golf CL version, disassembled in 6843 parts.